Thomas & Betts Carlon® Type LB non-metallic conduit body of trade size 1-1/2-inches, is suitable for schedule 40 and 80 rigid conduit. It features PVC construction. 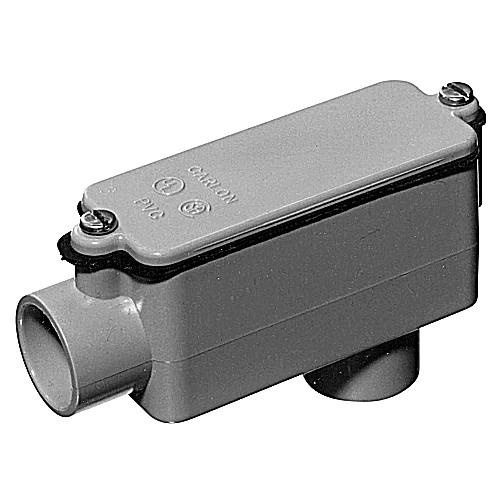 This conduit body in gray color, has two 90-degree hubs and offers threaded connection. This back access conduit body has 32-Cubic-Inch capacity. It measures 7-31/32-Inch x 2-1/2-Inch x 2-3/4-Inch. This conduit body has textured lids and foam-in-place gasket. Conduit body is RoHS compliant, UL listed and CSA certified.